The exclusive and prestigious 5 star hotel in Salerno, Hotel Raito, is located at the beginning of the Amalfi Coast among the blue sky, sea and lush green mountains embedded between vast citrus plantations and intense scents of lemon. 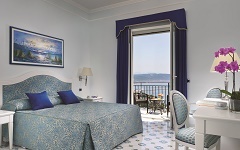 Recently renovated with elegance and refined furnishings, Hotel Raito, 5 star hotel in Salerno, will make your stay unique and unforgettable with its enchanted view overlooking the Bay of Salerno and the Faraglioni in Vietri sul Mare. Even its geographic position offers you the possibility to reach the principal locations of the Amalfi Coast (Amalfi, Positano, Ravello) and of the Campania Region (Pompei, Hercolanum, Napoli). - Shuttle bus from/to Hotel Raito/ Vietri city centre / beach: on request. - Beach services available (with fee). - Boat trips, car - moped - boat hiring: on request, with fee. Enjoy your stay at Raito Hotel, 5 star hotel in Salerno.